While many Rhode Islanders remained cozy in their beds on Sunday morning, more than 2,600 runners and walkers crossed the Claiborne Pell Bridge on foot during the eighth annual Citizens Bank Pell Bridge Run. All of the proceeds from this local-favorite event are donated to non-profits, and participants are encouraged to fundraise on their own as well; this year, the event raised more than $160,000 for charity. Despite the chilly, wet weather that seems to have become typical in Rhode Island this October, runners and walkers were all smiles as they completed the 4-mile course. The run/walk, which starts in Jamestown and brings participants over the Pell Bridge and into Newport, still boasted its signature, stunning views of Aquidneck Island and Narragansett Bay. The Citizens Bank Pell Bridge Run is the only day of the year pedestrians are permitted on the bridge. The event hosted by the Rhode Island Turnpike and Bridge Authority Foundation and is produced by Gray Matter Marketing. 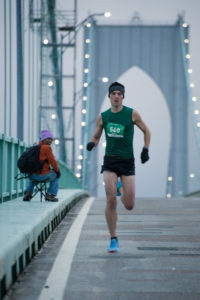 Geoff Nelson cruises to his seventh consecutive Citizens Bank Pell Bridge Run win. Graeme Clougher, from Newport, Rhode Island finished in 22:21, followed by Brett Musco from Cambridge, Massachusetts in 22:27. Courtney Koehler, from Newport, Rhode Island finished second overall for the women at 26:07, and the women’s podium was rounded out by Sutton, Massachusetts’ Jaqueline Shakar in 26:43. Finishers ranged in age from Liam Hager, a 5-year-old from Newport, Rhode Island, to 82-year-old Gail Healy, from Springfield, Massachusetts. Teams from local and regional nonprofits and running clubs came out in force in matching jerseys and costumes. An event of this scale would not be possible without the support of sponsors, first responders and volunteers. The Rhode Island Turnpike and Bridge Authority and Gray Matter Marketing would like to extend thanks to the Newport Police Department, Jamestown Police Department, and the Rhode Island State Police for providing key support during the race. 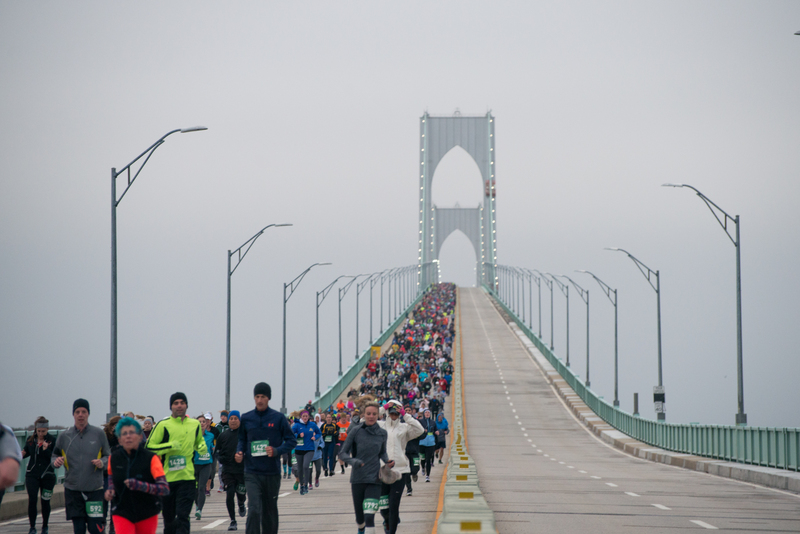 Title sponsor Citizens Bank continues to make the Pell Bridge Run a success year after year. Sponsors Run Newport, Keville Enterprises, Polar Seltzer, Newport Shipyard, WSP, Liberty Donuts, Hotel Viking, Kind Snacks, Fagan Door, Onne Van Der Wal, Discover Newport, Hippeas Snacks, Newport & Co. Physical Therapy, Studio Barre Newport, Newport Sock Exchange, Sole Desire and Griff Electric are incredible supporters of the event. 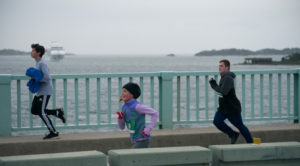 For a full list of supported non-profits, results, and photos, visit www.pellbridgerun.com. A date for the 2019 Citizens Bank Pell Bridge Run will be on October 20th, 2019. Registration information will be published soon!